The private spaceflight company SpaceX launches its first unmanned Dragon spacecraft from Cape Canaveral, Fla., on a Dec. 8, 2010 on a test flight using a Falcon 9 rocket in this webcast still. This story was updated at 2:33 p.m. ET. CAPE CANAVERAL, Fla. ? The first unmanned space capsulebuilt by millionaire rocket maker Elon Musk blasted off on a maiden voyagetoday (Dec. 8), in a historic milestone for his private spaceflight companySpaceX and the commercial space industry. SpaceX's Falcon 9 rocket, carrying the company's roboticDragon space capsule, lifted off at 10:43 a.m.EST (1543 GMT) from the Cape Canaveral Air Force Station's LaunchComplex 40. The capsule's successful splashdown in the Pacific Ocean more than three hours later made SpaceX the first commercial company to re-enter a spacecraft from low-Earth orbit. Shortly after launch, at 10:52 a.m. EST(1552 GMT), Dragon jettisoned the Falcon 9's second stage and began circlingEarth. 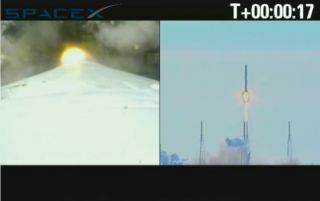 "Dragon is in orbit," alaunch controller said. "Great day here atSpaceX," SpaceX director of marketing Emily Shanklin said. "Lookslike we had a great flight." The successful liftoff occurred after an earlier launchattempt at 9:06 a.m. EST (1406 GMT) this morning was aborted just under threeminutes before launch, due to a false computer alarm. "This would represent animportant milestone in the history of space, heralding the dawn of a new erawhere private companies can now bring back spacecraft from orbit," Musktold SPACE.com before launch. "Successful recovery of Dragon would alsobode very well for future astronaut transport." The Hawthorne, Calif.-based SpaceX, short for SpaceExploration Technologies, was founded by Musk, who also co-founded the onlinepayment system Paypal, in 2002. Musk is also the CEO of Tesla, an electric carcompany. In the spectacular morning launch, the Falcon 9 rocket carriedthe Dragonspace capsule on its ascent into low-Earth orbit. The capsule separated from the rocket's second stage and made two orbits of theEarth while demonstrating various operations, including telemetry, navigationand maneuvering abilities. The launch was originally scheduled for Dec. 7, but wasdelayed 24 hours to give technicians time to investigate two cracks that werefound on the second-stage engine nozzle extension of the Falcon 9 rocket. SpaceX engineers worked overnight to trim the crackedsection of the nozzle extension, and tests that were performed throughout theday Tuesday showed that the repairs had been successful. Earlier this week, Musk told MSNBC that he predicts thechances of success for this test flight to be about 60 percent. With the success of Dragon's first test flight,SpaceX has become the very first commercial company to launch and re-enter aspacecraft from low-Earth orbit ? a significant milestone for the young butburgeoning private spaceflight industry. SpaceX's Falcon 9 rockets stand about 180 feet (nearly 55meters) tall and are 12 feet (3.6 meters) wide, according to SpaceXdescriptions. The Dragon capsule and its unpressurized trunk are just over 20feet (6 meters) long and have an interior cabin that is just over 10 feet (3meters) wide at its widest point. The Dragon space capsules are named after the song Puff theMagic Dragon by the group Peter, Paul and Mary, because many critics consideredit to be impossible, SpaceX officials have said. SpaceX's Falcon 9 and smallerFalcon 1 rockets are named after the Millennium Falcon, the fictional"Star Wars" spaceship of choice for the character Han Solo. Today's test flight was also the first by any company underNASA's Commercial Orbital Transportation Services (COTS) program, which isdesigned to stimulate the development of privatevehicles capable of carrying cargo and crew to the International SpaceStation. As part of the COTS deal, NASA has provided SpaceX with $278million for successful demonstration tests of a vehicle and hardware capable offerrying cargo to the space station. Separately, SpaceX has a fixed $1.6 billion contract withNASA to use its Dragon spacecraft for cargo delivery flights to theInternational Space Station, following the retirement of the agency's spaceshuttle fleet. SpaceX plans to fly its Falcon 9 rocket and Dragon capsule on atleast 12 unmanned missions to deliver supplies to the space station through2016. NASA has also inked a $1.9 billion deal with the Virginia-based spaceflightcompany Orbital Sciences Corp. to provide eight cargo flights to theInternational Space Station using its unmanned Cygnus spacecraft and Taurus 2rockets. The first flights of those craft are expected in 2011. SpaceX will follow up this demonstration with a series ofother test flights, each with increasingly more complex mission objectives. Ifthe standards of the COTS program are met, SpaceX could begin carrying cargo toand from the space station as early as next year. Eventually, SpaceX hopes to win a contract to one day ferryastronauts to and from station ? though the Dragon capsule has yet to beman-rated to carry human passengers into space. You can follow SPACE.com Staff Writer Denise Chow onTwitter @denisechow.Visit SPACE.com for completecoverage of SpaceX's debut Dragon spacecraft launch.